I was born and primarily raised in Pittsfield, MA until I graduated from parochial school in 1979. I served the United State Air Force in Okinawa (1981-1982), California (1982 – 1985, where I met my wife Lois), Germany (1985 to 1990) and then Loring Air Force Base here in Maine (1991 until my disability retirement in 1993). I then worked as an Air Force Civilian until the base closed in 1994 and bought a house in Limestone where we currently live. Since 1994 I have been employed as a manager at The Aroostook Medical Center in Presque Isle. 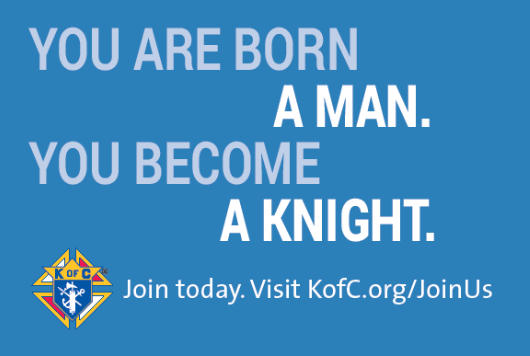 I became a Knight of Columbus in 1995 and have served as the Grand Knight, Deputy Grand Knight and other officer positions for both Aroostook Council # 2851 in Limestone and Northern Maine Council # 1753 in Fort Fairfield. During my first year as Grand Knight in 2004 our council received Star Council. From 2014-2016, I served as Faithful Navigator for Assembly 0350 in Fort Fairfield. During my tenure as a Knight of Columbus, I have served the Maine State Council as District Deputy for five years (1997-2000 & 2002-2004), State Pro-Life Couple with Lois for 2 years (2000-2002), State Publicity Director and Convention Coordinator with Lois for 2 years (2008-2010). Thus far as a State Officer I have served as State Warden (2010-2012), State Advocate (2012-2014), State Treasurer (2014-2016), and currently serving at State Secretary. We worship at St. Louis Church in Limestone where I am a member of the Music Ministry. Lois and I have been married for 34 years and we look forward to seeing you all around the State during our travels. God Bless. I was born in Portland, and grew up in the Boothbay Region, graduating from Boothbay Region High School in 1991, and the University of Maine in 1996, with a degree in Business Administration. After working in several positions (including substitute teacher) I went to work as an accounting assistant at Inland Seafood in Boothbay in 1999. I was hired as a cost accountant at Hardwood Products Company in Guilford, Maine in 2000, where I have been ever since. I have been in the Order for 14+ years, joining Father John Sullivan Council 10356 in Boothbay Harbor, where I served as Financial Secretary. I have been a Fourth Degree member since 1999. I served as Deputy Grand Knight and Grand Knight for Father Patrick Hayes Council 3172 in Dover-Foxcroft, and currently serve as council Warden for St. Agnes Councill 4861 in Pittsfield. I also currently serve as Faithful Navigator for St. Agnes Assembly 354 in Pittsfield. I have served as a District Deputy for a total of six years under four State Deputies. I served four years as Family Life Activies Director from 2008-2012. I have also served on the Kennebec Valley Major Degree Team since 2000, and the Maine District Fourth Degree Team since 2007. In 2012 at the 117th Annual State Convention, I was elected State Warden. I can’t wait to get started in working for you. I have been married to my lovely wife Joanna for five years, and enjoy sharing my life as a Knight with her. We are members of St. Agnes Parish in Pittsfield, where we served as faith formation teachers the past three years. I have also been a lector and enjoy sharing the Word of God with others. I was born in Fort Kent and grew up in St. Francis, Maine. I graduated from Fort Kent Community High School in 1982 and from Eastern Maine Community College in May of 1984. I have been employed as a Radiographic Technologist for 28 years. I have held several positions and have worked in the Cardiac Catherization Lab at Eastern Maine Medical Center since 2005. I have been a Knight for 17 years. I have held many offices for the Pine Cone Council #114 including the Office of Grand Knight. I currently serve as the Council’s Treasurer. I am also a member of the Pine Cone Assembly #339 and am proud to serve as an Honor Guard. I was installed as District Deputy of District #5 in 2010 and have served two State Deputies. I was elected to the office of State Warden at the 119th Convention in April of 2014. I have been married to my wife Patricia for 28 years. We have two daughters: Amanda who teaches Fourth Grade at Carmel Elementary School, and Ashley who is a Junior at Rivier University in Nashua,New Hampshire. We are members of St. Paul the Apostle Parish and reside in Hermon. We enjoy serving at St. John’s Church and our community. We are looking forward to meeting you and making new friends as we travel throughout the State. I was born in Winslow, ME, and spent nine years with the Ursuline’s at Mount Merici Catholic School. After graduating from Winslow High School, I attended the University of Maine at Orono for two and a half years, majoring in music education and mechanical engineering. I then transferred to Thomas College, graduating with a BS in Marketing Management, and then earned an MS in Business from Husson College. Currently, I own Berry’s Stationers in Downtown Waterville, an art and office supply, and custom picture framing business, which has been in operation since 1897. At the young age of 18, I couldn’t wait to join the Order, and the relatively new council in Winslow. Once I began, I was excited to show the colors and joined the Patriotic Degree. I have held most positions in the Council, including Grand Knight and Financial Secretary, and in the Assembly as well, including Faithful Navigator and Faithful Comptroller. I served six years as a District Deputy for Past State Deputies Roger Melancon, Richard King, and Walter Golojuch. Most recently, I served eight years as the State Youth Activities Director. I have captained our Admission Degree team, as well as the Kennebec Valley Major Degree Team, and worked on the Patriotic Degree team. My wife Barbara and I were married in 2007, and I gained two step-children, Stephanie and Nicholas. We live in Augusta, have both been active in different ministries in our home parish of St. Michael’s, and are fully committed to serving the Maine State Council. At the 123rd Maine State Convention in 2018, I was elected to the position of State Advocate. I am looking forward to meeting and working with all of you in this capacity over the next two years. I was born in Chicago Ill and spent my school year at Catholic grammar and high school. After graduating high school, I entered the military. Currently, I am retired and putting all I have into the Knights of Columbus. I joined the order 36 years ago in Van Buren, Me. I have held the positions of Grand Knight, Deputy Grand Knight, Faithful Navigator and most recently, District 2 Deputy. I am on the following degree team: Admission, Formation and Knighthood. Also honored to serve in the Honor Guard. My wife Priscilla and I were married 50 years ago in 1967. We have two sons: Donald and Chad. Our son, Donald passed away 12 years ago. I was elected as State Warden at our 2018 Maine State Convention. I am honored and I look forward to work with all of you state officers. My Name is Norman A. Gray, and I prefer Norm. I was born in Lewiston Maine in 1958, and have been a resident of Auburn my whole life. I attended St. Louis Catholic School in Auburn until sixth grade, God sent me as a test to those poor, sweet, innocent nuns. Then I attended Auburn public school and graduated with the class of “76”. In High School, several of my catholic school co-survivors and I decided we needed to look into the new CYO fad in Lewiston, and started our own in Auburn. Many of my CYO friends are still my dearest friends to this day! I enlisted in the United States Navy in June of 76 and studied Aviation Fundamentals and Hydraulics at NATTC Millington Tennessee, on the outskirts of Memphis. My First duty station was NAS Oceana, in Virginia Beach, Virginia with Fighter Squadron 84, the Jolly Rogers. I spent the next five years working on, in and around F-14 Tomcat fighter jets. We split our time between Sea Duty on board the USS Nimitz, and on shore at Oceana. On the Nimitz, Naples Italy was our European home port. I have fortunate enough to have seen the sun rise and set in the Holy Land, Egypt, Italy, England, France, Greece, Tunisia, Spain, Portugal, Cuba, Puerto Rico, and St. Thomas the Virgin Islands. My career ended in 1981 and I attained an E-5 rank. I enlisted as a young 17 year old boy and the Navy sent home a 22 year old man. I treasure the memories and friends I have gathered from those times, they all helped to make me the man I am today! My first job after the Navy was as a machinist for Jones and Vining making injection molds for shoe manufacturing. During the first few years after the Navy, I worked part time as a bouncer at an afterhours club in Turner Maine during the Disco heyday. To make a Very Long and somewhat boring story short, I met my wife Kay at that same club. She was a bartender, and I was a bouncer. I continued to upgrade my skills and knowledge in the metals trades at various companies throughout central Maine for many years, up to becoming a team leader of 12 millwrights working various mill “shutdowns” throughout the whole state. I joined the Order in 1984 and have held most third degree offices including Advocate, Warden, Deputy Grand Knight and Grand Knight. I served as District Deputy for both Past State Deputies Bill Meador, and Dale Voisine. And was State youth director for 2 years until my election to State Warden in 2008. I am Currently State Treasurer and look forward to serving you all in the future.